I am going to be living in this dress from J.Crew Factory this summer. It is so comfortable and lightweight. It is already getting so hot here in Florida :( I think it was in the 90's yesterday! Its getting to the point that you can't walk outside without breaking a sweat! It is awful! J.Crew factory is offering 25% off when you spend $100 or more with the code GETMORE. So this dress is already on sale for $49.50 and if you spend $100 (which for me at J.Crew Factory is not that hard to do) you will get another 25% off. Such a steal. See some of my picks below. Love the striped dress with the pink bag and gorgeous statement necklace! So pretty!! In love with your bag and your wedges are beautiful! I love how you elevated the simple striped dress with the statement necklace and the bag. Agreed! We're close to triple digits here in AZ. :( Not ready for this yet. We don't have the humidity of the ocean though. :) Looking fab as always! I love the simplicity of the dress with pops of color from the bag and necklace! This is so lovely! You look stunning! Great wedges and bag! You always look so stylish and glamorous! I am beyond in love with this entire outfit! Hey Jade, love the outfit and your blog. Just discovered it and I'm blown away. What size did you get this dress in? Thanks! 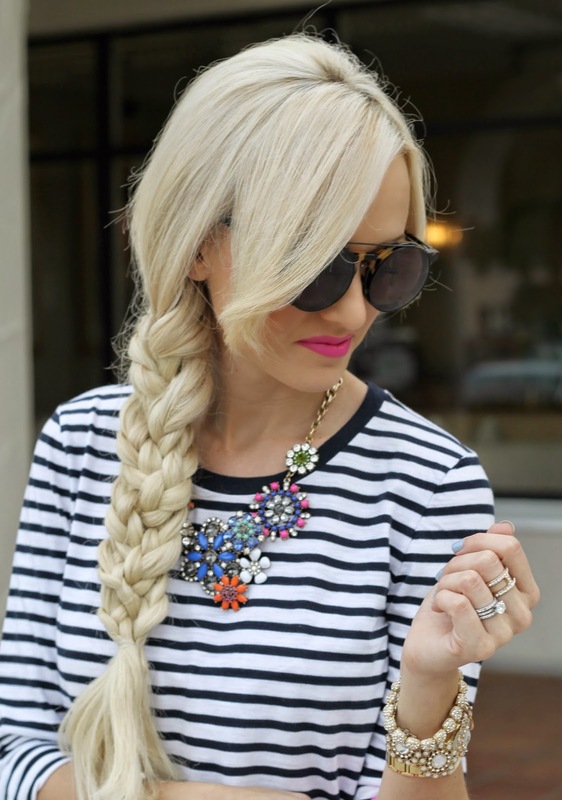 Looks like you would need a degree to achieve that braid - fabulous darling! Amazing bag, love the pink!